Thursday, June 14, 2018 at 6 pm. 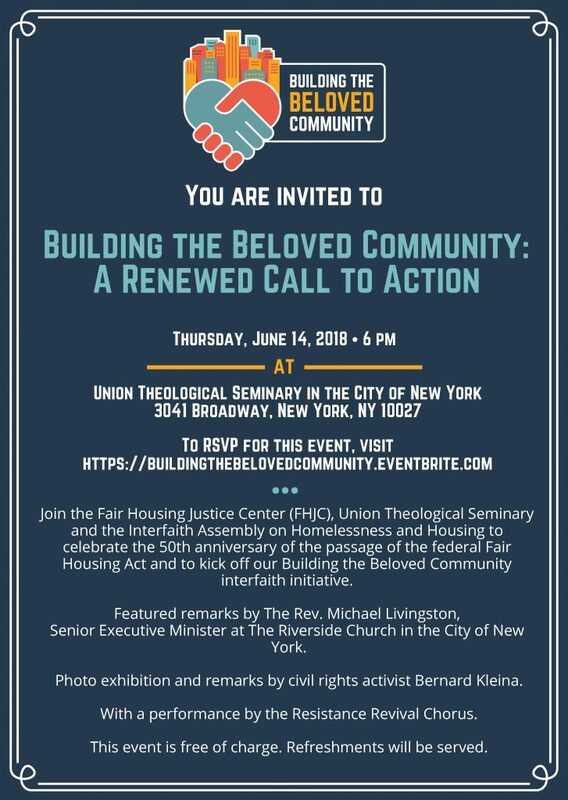 Join the Fair Housing Justice Center (FHJC), Union Theological Seminary, and the Interfaith Assembly on Homelessness and Housing to celebrate the 50th anniversary of the passage of the federal Fair Housing Act and to kick off our Building the Beloved Community interfaith initiative. Featured remarks by The Rev. Michael Livingston, Senior Executive Minister at The Riverside Church in the City of New York. Photo exhibition and remarks by civil rights activist Bernard J. Kleina.